CLOSE OUT PRICING! WHILE SUPPLIES LAST! East Tennessee State University Tartan T-shirt. Currently only available in size: Small. East Tennessee State University Long Sleeve T-shirt. Currently available in Size: X-Large Only. Vintage Bucky Tote - Presenting a new spin in a favorite style. This tote will soon be your favorite! The straps are sturdy and the tote is a perfect bag size for everyday. Double zipper and recessed closure to keep things safe, yet accessible. Measures 23" wide and 14" tall. Made in America. East Tennessee State University Tartan Bow Tie. Adjustable to 18" Self tie. Made in USA. Dry Clean. East Tennessee State University Tartan Tie. Measures Regular 56" x 3 1/4" and XLong 63" x 3 1/4". Made in USA. Dry Clean. Wearing your East Tennessee State University Tartan Tie is a great way to represent your school. Perfect for special events, game day, church, reunions or any day you want to feel your university pride! . East Tennessee State University Tartan Poly Luxury Scarf. Perfectly balanced. Measures 60" x 11 3/4". Dry Clean Only. East Tennessee State University Tartan Lambswool Scarf. 100% Lambswool. Measures 79" x 12" plus 4" fringe. Made in Scotland. Dry Clean. Scottish quality made to last. For men and women in the popular length for knotting around the neck for style and warmth. Add a splash of color to any outfit with your ETSU Tartan Lambswool scarf! 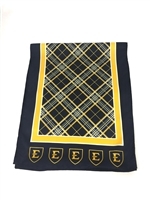 East Tennessee State University Tartan Throw is made from pure 100% lambswool, it's lightweight, soft and warm. Ideal as a throw for your home to lay over a bed or sofa. Could be used as a picnic rug or blanket for spectating outdoor events during colder months. Throw measures 72" x 56" including fringe. Made in Scotland. Dry Clean Only.